Going to Morocco had been on our bucket list so when our cruise plans, which included stopping in Morocco, were canceled, we started looking for another way to see the country. Boy, are we glad that we stumbled upon the Morocco Tours website. 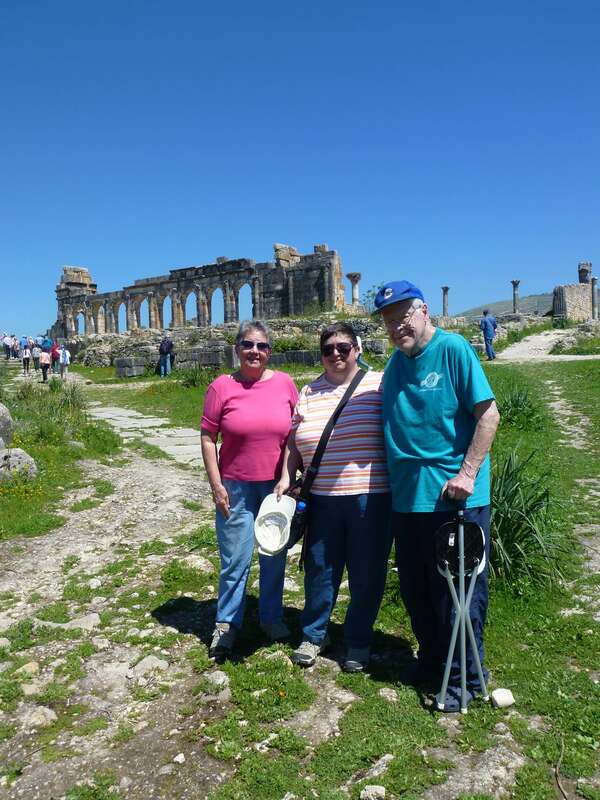 Our two week tour in April 2015 allowed us to see a great deal of the country and have a number of new experiences despite having worked/lived abroad for almost 30 years with the U.S. Diplomatic Corps, setting foot on all seven continents, and traveling through almost 120 countries. The scenery is varied and at times breathtaking – from sand dunes to hills to snow covered mountains all in the same day. We were the last passengers out of Customs and were so relieved to see the “Welcome to Morocco” sign being held by our driver & host for the next two weeks, Jamal. We apologized for making him wait so long but some of our luggage hadn’t arrived on our Iberian flight. He immediately assured us he would “take care” of tracking our suitcases, which he did, constantly checking with the airline and getting them delivered to Fes where we picked them up a few days later. And he continued to “take care of us” for the next two weeks. Jamal quickly assessed that we had some walking issues and arranged our schedule around them–maximizing what we were able to see and do by driving to certain spots around the medina in Fes rather than having us walk the entire time and helping us hire a horse carriage for a ride around town to see more of Marrakech. He arranged for us to spend time with a family in the Kasbah Maadid in Erfoud since we would not be able to handle the walk to the Kasbah Ait Benhaddou outside Ouarzazate. He also introduced us to Berber Bedouins in the desert including a stop at a family’s tent (he is Berber so he spoke their language). He even came with us to the tented camp in the Sahara to visit with my husband while my daughter and I took the camel ride at sunset so that he would not be alone (they also had a good time discussing the affairs of the world so that may have been part of the reason as well!). Jamal’s expertise at handling the mountain roads allowed us to proceed on schedule and with confidence in our safety and the guides he found for the tours in each town really knew their material (they all spoke excellent English so we had no problems communicating with them as Jamal was usually not with us). And as an unexpected surprise, we were able to experience an ice/sleet/hail/snow storm on the edge of the Sahara!!! The medina in Fes is a site to see and in Marrakech we really enjoyed the Berber Pharmacist. The square in Marrakech was also very interesting but I would advise that you go in the day time. While there is less to see, at night it is very crowded so while one gets the “experience” you can’t really see much. On our second day in Fes we tried out an Elizabeth Arden type local hammam (suggested by Jamal) Nausikaa Spa. 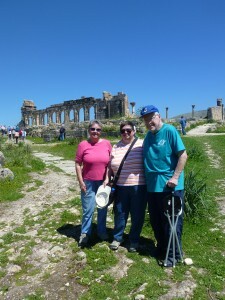 What fun and a cultural experience we won’t soon forget. And as we were there over Easter, Jamal found a Catholic church for us to attend on Good Friday. 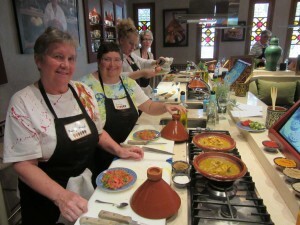 On our second day in Marrakesh we participated in a cooking class offered by the hotel (La Maison Arabe). If you plan to take the class definitely ask for the country club location rather than at the hotel, and if you have time, stay to enjoy the pool and gardens. The facilities are excellent, the teachers great and the food you make delicious. And if you get the chance to see Argon oil being made be sure to stop and try some of the argon & nut butter while you are there. Overall the hotels were very good as was the food, although the buffets in Erfoud and Ouarzazate were more standard tourist fare than the other hotels which were more upscale (although they all had Moroccan and more Western offerings). Be prepared for very large portions at all the meals; even at the places we stopped at for lunch we often had two entrees for the three of us and it was plenty. On our last day back in Casablanca we had dinner at Rick’s Café. Despite what we had read it wasn’t a tourist trap and the food was upscale. Just make sure to be there when the piano player (“Sam”) comes which isn’t until about 9 p.m. As we were there the first two weeks of April the outdoor pools were a little to chilly to really enjoy but the indoor pools were fine and all were clean. Our time in Morocco flew by and we were very sad to say farewell to Jamal. Inshallah our paths will cross again. He very much helped make our trip to Morocco an unforgettable experience. We can truly say he was the “jewel in our crown” during our trip to Morocco. Note: Two words to the wise if you have walking issues. First, be sure that the company knows ahead of time so that they can work with the hotel to get you rooms either on the ground floor or accessible by elevator (where possible) & arrange your tours accordingly. 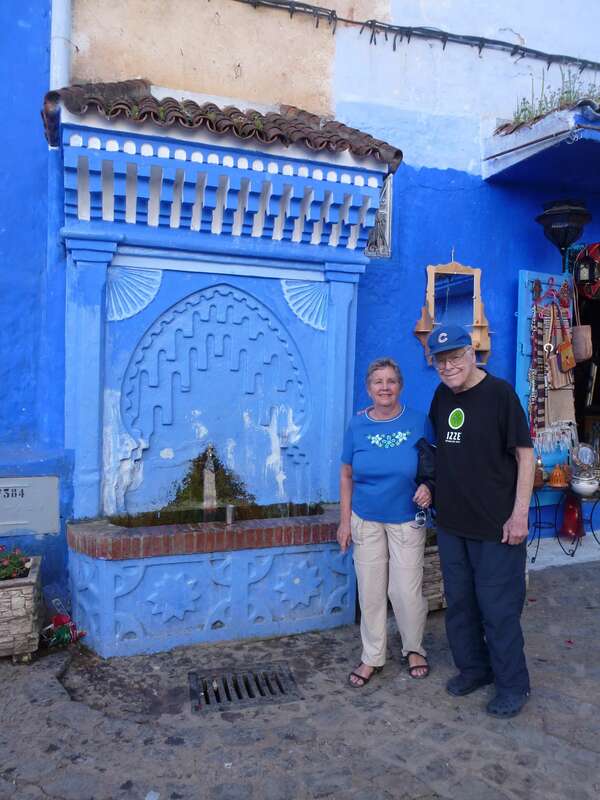 And second, you probably want to skip Chefchaouen as it is all in the hills. My daughter and I who did the walking tour around town felt like mountain goats with all of the hills and steps!